We need to talk about Spock, of course, but before we talk about Spock, we need to talk about "Going Down To Liverpool." That was a song by Katrina and The Waves but The (immortal?) Bangles covered it in 1984, and for the song’s video on MTV they chose to film it as limo ride – The Bangles in the back, singing, with a seemingly irritated, my-time-is-too-valuable-for-this-horseshit chauffeur. The chauffeur was played by Leonard Nimoy. Why him? The trivia masters will tell you it’s because Susanna Hoffs was friendly with Nimoy’s son, Adam, but over-analyzers know better. It takes a lot to play annoyed in the presence of Susanna Hoffs, one of the 80’s grandest divas, and who had more experience playing irritated compatriot to a diva than Leonard Nimoy? It’s one of those never-ending eerie cosmic coincidences that the venerable Interwebs domain Grantland ran a "Second Banana" Tournament the exact same week the man who played Spock passed away (Friday, aged 83) but that’s exactly what happened. Spock advanced all the way to the Final Four, the semi-finals, before being dispatched by Canada. Grantland’s resident Trekkie was enraged by this development, and how can you blame him? It robbed us of a Spock vs. George Constanza showdown, which would have been incredible. It would have been incredible because, in fact, Spock and Constanza were polar opposite second bananas. Seinfeld was the straight man to Constanza whereas Spock was the straight man to Kirk. And while Jerry and George viewed "The Wrath of Khan" as the pre-eminent "Star Trek" film (though Kramer was partial to "The Search For Spock"), I admit to having a place in my heart for the fourth film in the series. We need to talk about "Star Trek IV: The Voyage Home", of course, but before we do we need to talk about the opening passages of “Star Trek V: The Final Frontier” set in Yosemite National Park. 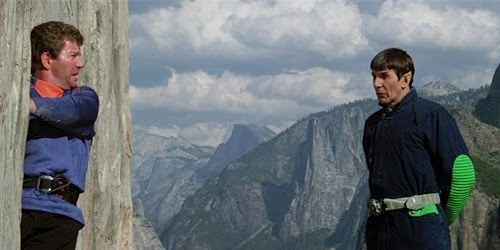 The scene, if you don't recall, finds Kirk free climbing El Capitan and Spock flying in on some sort of foot-jet pack doohickey, allowing them to have a colorful give and take, right there on the side of a freaking mountain. "Twelve hundred points of interest in Yosemite and you pick me," says Kirk, and that cuts right to the heart of the matter. Wherever they were, whatever place, whether on futuristic Earth or out there in the far-flung reaches of the place called space, what really mattered was these two, their friendship, testy and loving, their emotional push and logical pull, and their banter. They were a comedy duo with semi-philosophical tendencies. That mountainside verbal hoedown leads into the incredible scene around a campfire where Dr. McCoy says of a squabbling Kirk & Spock: "You know, you two could really drive a man to drink." Maybe it's because my first experience with "Star Trek" wasn't "First Generation", or even "The Motion Picture", but re-runs of the original series on our old black & white TV in the kitchen that often came across more like a sitcom than drama. And that leads me to "The Voyage Home", the greatest time travel movie ever made, the time travel movie that understood justifying the means of time travel was so much less vital than what the time travel wrought. And in "Star Trek IV", it wrought something less logical than Warner Bros. live action Looney Tunes. In many ways "The Voyage Home" foreshadowed film's overriding and ridiculous importance on my absurd existence. It was Christmas Day 1986 and presents had been unwrapped and the meal had been consumed and all I wanted to do in my official capacity as College Football Fanatic was watch the Sun Bowl. My parents, however, decreed that our family would be going to the theater for a showing of "The Voyage Home." I rebelled, but I lost. I'm glad I lost. God, what a marvelous Christmas Day, and viewed through the prism of time I wonder if that's the moment when in spite of worshiping at the pagan altar of college football I sub-consciously realized the film de cinema was truly my bag, baby. America's 1987 box office champion, "Three Men and a Baby", was directed by Nimoy, a delightful choreographing of comedy, but he outdid himself a year earlier with "The Voyage Home." In her original review for The New York Times Janet Maslin knocks around Mr. Nimoy's supervision of special effects and while her assessment is not invalid, well, in spite of "Star Trek's" space opera origins the effects are less the point than the comedy. Perhaps Nimoy struggles in the get-go, tying up loose ends from the previous movie and setting the table for the current one. Yet once the film goes back in time to then-present day San Francisco, he demonstrates a breezy professionalism. This isn't sci-fi, this is screwball. It's a fish out of water comedy that finds the crew of the Enterprise going back to 1986, forcing these futuristic characters to try and fit themselves into a "primitive and paranoid" culture where they don't belong. The film's comic timing, never harried, is built with notably formal elegance to all manner of extremely polite payoffs. So many of it jokes are cornball, yes, but nevertheless effective, not so much middlebrow as totally accessible, an approach that in this day and age feels wistfully old-world. Screwball comedies, however, of the golden era often had a socially conscious tinge to go with all that repartee, and "The Voyage Home" is no different. It packs a pro-environmenetal message into its narrative as the crew's quest involves rescuing a pair of humpback whales to bring them forward into the future, a place where they have gone extinct, quietly yet forcefully indicting mankind for its ecological idiocy. Yet simultaneously it takes an extra-terrerstrial - Nimoy's Spock - and makes him come to grips with his humaneness, and do so in a Reagan-era habitat not outwardly lending itself it to civility. To my admittedly non-Federation approved eyes that was always the spiritual center of "Star Trek" - the yin & yang of emotion and logic, embodied in the kindly combative relationship of Kirk and Spock. And I will confess that in re-watching "The Voyage Home" the whole way through twenty-four afters after Mr. Nimoy's passing I found myself profoundly moved by a passage late in the film between Spock and his father. It's no secret that Leonard Nimoy had a complicated relationship with the role that made him an icon, and how could he not? The part took him to a celebrity stratosphere that transcended most. Everyone mourned his passing, Trekkers, Trekkies, Federation of the Planet part-timers, neophytes, etc. And I think that's because the eternal inward battle of thinking with our heads and thinking with our hearts is one thing that will for certain exist in the twenty-third century the same as it existed in the twentieth. The key is to find the place that Spock found by the end of "The Voyage Home", which was the same place Nimoy found by the end of his long life. Spock's father asks his son if he has a message for his mother. Spock replies matter-of-factly: "Tell her...I feel fine." It's too bad my first visit to your blog in a couple weeks requires me to read two memorial pieces, but they were both lovely. This one reminds me that I'm disappointed I didn't memorialize Nimoy on my own blog. As a bit of a Trekker myself (I love the movies but never watched the show, which seriously impacts my credibility), I would have found him one of the likeliest people to memorialize on my blog. And I considered it, but I couldn't find the angle, and I was backed up with other ideas at the time. Anyway, thanks for saying some of the things I would have said if I'd written one. I know, right? Two obits in four days? Ugh. In some ways, I felt unqualified to memorialize Nimoy. Yet, I'm over-qualified, I think, when it comes specifically to "Star Trek IV", which is kind of why I wanted to write this - to show that even for someone who wasn't at all a "Star Trek" fanatic (even a "fan", per se) he could have such an impact.